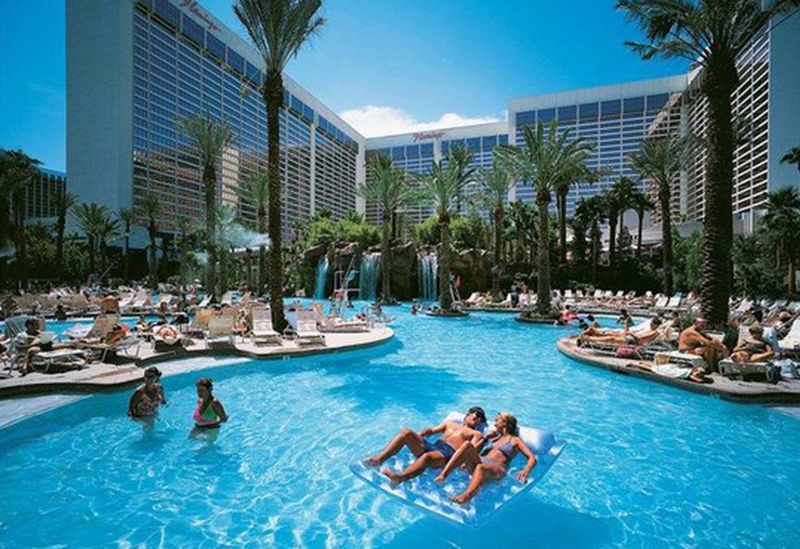 Located at the Flamingo in Las Vegas, Go Pool is a secluded adults-only playground where the 21+ crowd come to relax. 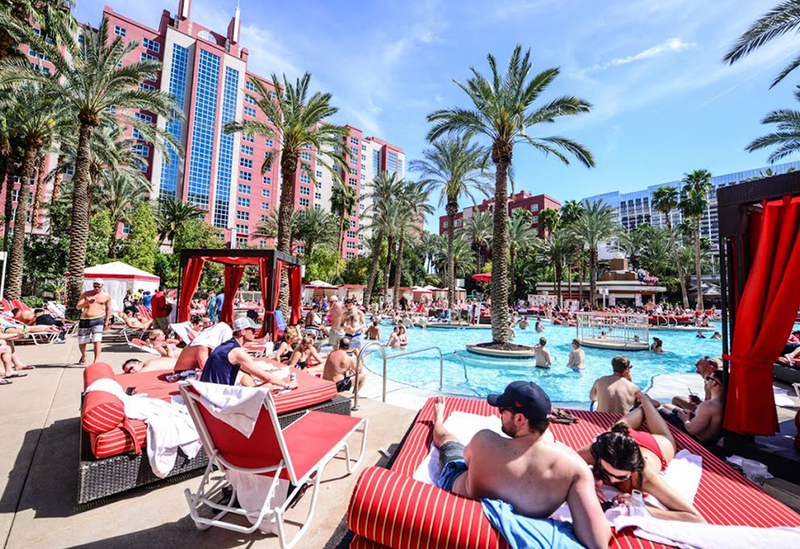 While the Flamingo also offers the Beach Club Pool which is open to all ages, the Go Pool offers mature services and amenities, including celebrity appearances, special events, contests, rotating resident DJs, and go-go dancers. Experience the ultimate summer pool party scene with music and frozen mixed drinks in a tropical paradise. 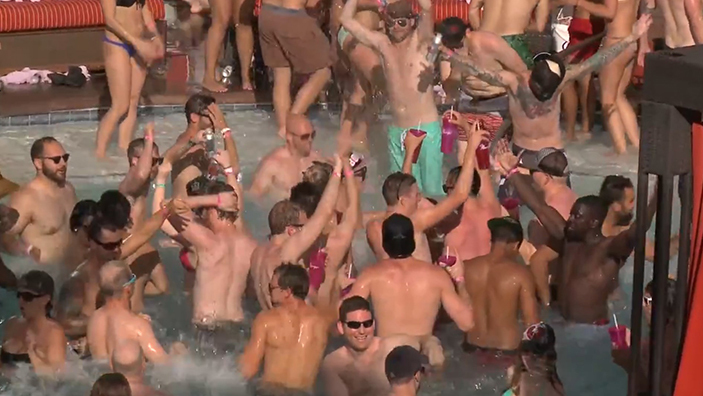 Much more than your typical pool party, this Las Vegas hot spot offers adults a high-energy, non-stop pool party environment. Surrounded by more than 15 acres of lush landscaping, lagoons and a beautiful cascading waterfall, the outdoor venues offers the perfect combination of relaxation and entertainment. Amenities include four different pool areas, three whirlpools, waterfalls, poolside spa treatments, and two bars, VooDoo Beach Bar and Cruzan Island Bar. If you’re planning on staying awhile, you’ll want to secure some comfortable seating. The pool club offers chaise lounges, daybeds and cabanas for guests to reserve and use. The spacious cabanas offer a luxurious and private place to relax and comes with a wide range of amenities, including a 42” plasma TV, assorted fresh fruit platter, mini-refrigerator, two chaise lounge chairs, rolled iced towels, safe lock box, bottled water stocked daily inside refrigerators, and a complimentary bottle of liquor with your choice of up to three mixers. Go Pool is open daily from 9 AM to 5 PM. 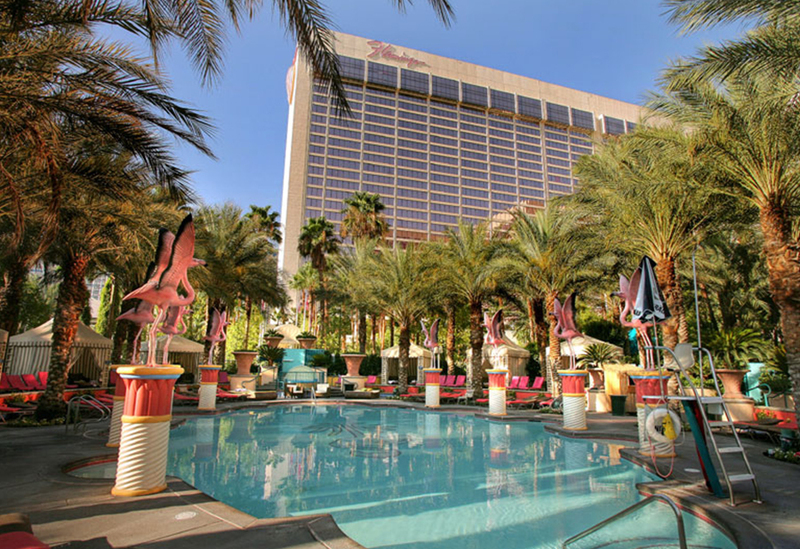 While entry into the pool complex is free for hotel guests, the cover price is $15 for other Caesars entertainment guests, and $25 for non-hotel guests. In addition to daybed and cabana rentals, the venue offers three full-service bars, daily cocktail service, daily drink and beer bucket specials, daily gourmet food service, and more. For guests looking to have a little fun during their visit, there is a waterslide, outdoor blackjack and craps tables, and poolside spa treatments. Go Pool is constantly bustling with fresh entertainment and events. At any given time, guests can enjoy disc jockeys, dance-offs, limbo, and raft race contests with fun prizes and giveaways. The venue also has other fun perks, such as go-go-dancers, Jell-O shots, and live performances by some of today’s biggest celebrities. 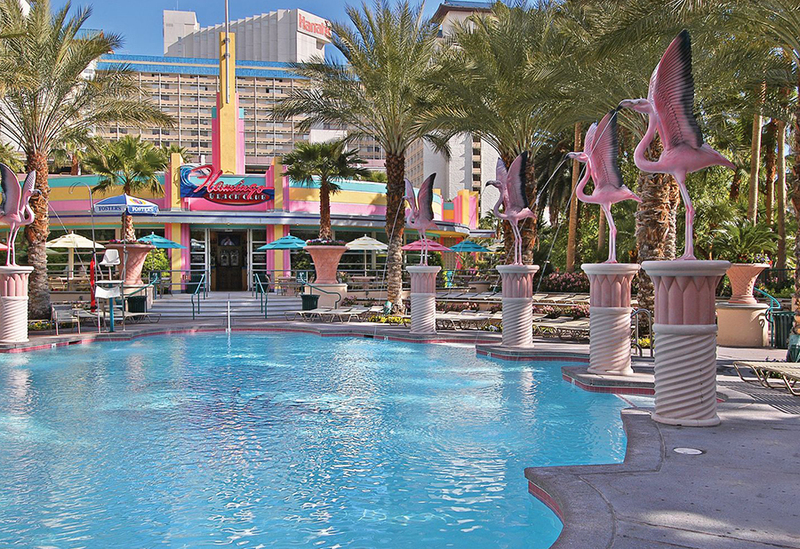 At the Flamingo, pool season runs from mid-March until the end of October. If you’re in Las Vegas during the warmer months of the year, be sure to stop by and experience Go Pool for yourself. For tamer adults and those with kids, the Flamingo also offers the Beach Club Pool. This main pool area is suitable for the whole family and features tropical palm trees and vegetation that surrounds the pool, views of the High Roller Observation Wheel next door, and a café just steps away. There is also a free waterslide that brings you down a faux rock slide and into a wading pool below. Whether you’re looking to just relax with a friend or splash around with the kids, the Beach Club Pool is a great family-friendly atmosphere. The entertainment at the venue is also excellent. The DJs play daily from noon to 6 PM, and are always out there working the crowds, taking music requests, and just creating a relaxing party vibe. As you’re taking in the array of hip-hop music, order from a menu that features specialty cocktails and delicious food items that you can snack on poolside. Flamingo offers an exclusive pitcher service that provides a popular alternative to standard bottle service. Pre-mixed cocktails are also available, including options such as Pink Lemonade, Mojitos, and Sangria, served in ice cold pitchers. 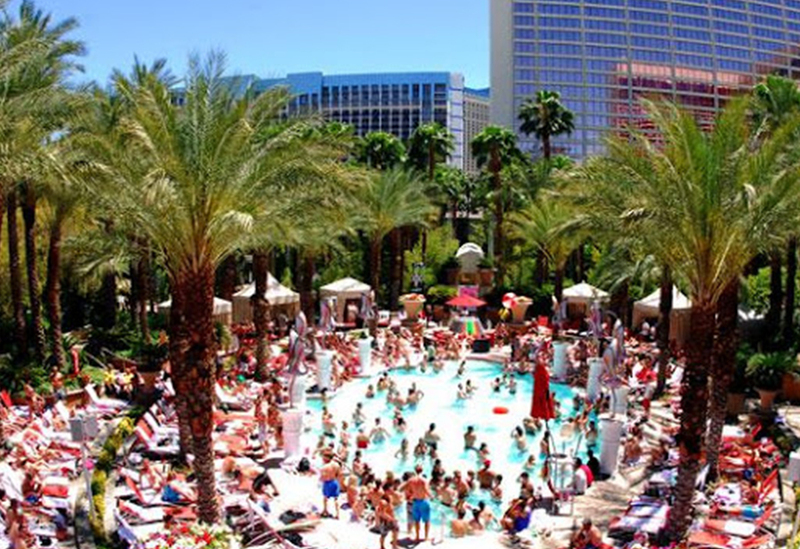 Pool season is here so take the time to visit Las Vegas. Been to this pool party?